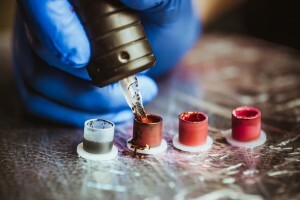 INK BLOCK designed for tattooists to eliminate wet waste is a low cost solidifying and denaturing agent that’s safe and easy to use and fully compliant. The primary purpose of INK BLOCK is to avoid wet waste escaping from clinical sacks. Rendering liquids safe to dispose of makes sense, avoiding liquid waste escaping from clinical sacks makes them safer to handle, collect, transport and incinerate/landfill.